Prince of Wales Terrace, Kensington W8. Original profiles were taken from the elevation of the building which was to remain and new reconstituted stone units were manufactured and fixed by us to the three new, remodeled elevations. 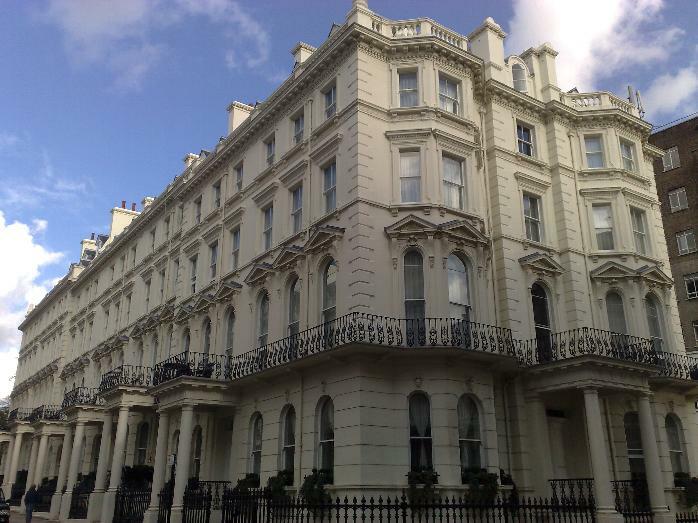 Once again the specification of this contract was to replicate that of stucco using a reconstituted stone. Many of the classical stone elements were present here including Pedimented heads, Corbel and Consort brackets, String, Label and Freeze courses, Quoins, Dentils, Window surrounds, Balustrades, Copings and Plinths. Not forgetting, of course, the Prince of Wales mask incorporating the Prince of Wales feather on the Key stones.